Point A is the location of the dealer where we bought our RV. 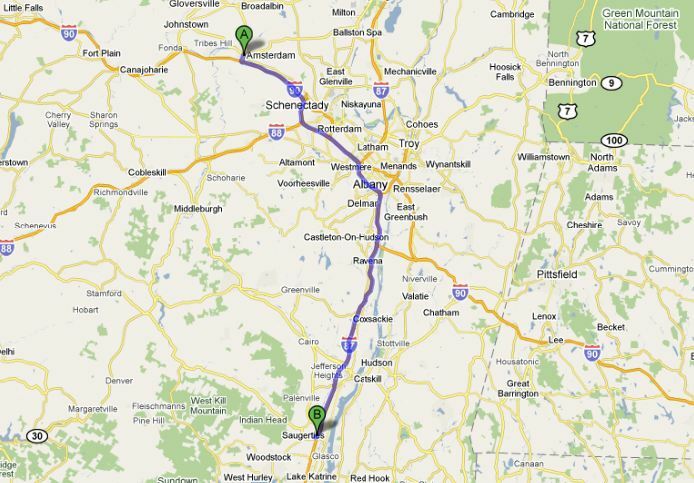 Point B is our storage facility in Saugerties, NY, where we’ll be keeping it for the next month. The blue line represents the one-hour, 23 minute, 74.5 mile drive, I needed to complete to get the rig from Point A to Point B. Piece of cake . . . except I’ve never driven an 18,000 pound, 35 foot, Class A motor home before. Conceptually I know how to drive it; it turns wider because of the length; the back end swings out to the opposite side when turning because of the shorter wheel base; it’s wider than a car so I need to mind the right hand side; it stops much slower; etc. etc. etc. But as any college professor understands, knowing and doing are two completely different things. Nonetheless, today’s the day I needed to saddle up and take this puppy for a spin. A couple of things surprised me about the trip. One, I didn’t wreck it. That was pretty cool, and an important first step in our plans. The second is the great visibility I had of the road. Not only in front, but also along the sides, and to a certain extent, in the back. Because of the large double mirrors and the high vantage point I actually had a better sense of where I was on the road than when I’m driving my car. But that high vantage point has a drawback . . . bridge overhangs look looooooow. Passing under bridges, even when the elevation is marked, feels like a leap of faith. I keep picturing the top of the rig getting sheared off by a low bridge. But not on this trip. Ship and crew arrived safely at their appointed destination with nary a scratch. So far, so good.